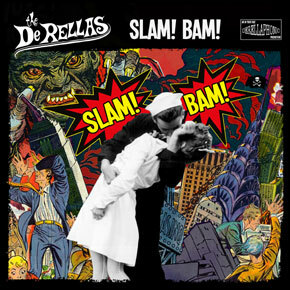 The DERELLAS are back with Danny Fury (LORDS OF THE NEW CHURCH, ROGUE MALE, KILL CITY DRAGONS…) behind the drum kit, what a great choice!… And as soon as the first song “Rock n Rollercoaster”, you can hear that the band sounds tighter, heavier now, bringing The RAMONES or ZODIAC MINDWARP to mind. Songs like “Kids Wanna Slam” and “She Kissed The Gun”remind me of the TRASHCAN DARLINGS (one the best glam punk bands ever! ), while “Don’t Go” will make every RAMONES fan in the universe raise their hands. If you’ve seen the band live before, then you know that their version of “Be My Baby” is always a great moment of their set, well you’ll get it on this record too! I guess the last song on here, “Mutha Fucker” must also be a killer live glam punk’n’roll number! The DERELLAS have never sounded that good, and since it’s only my opinion, I can only advise you to check out yourself!/Laurent C.